The ArcGIS API for Flex application provides easy access to an array of information on the state’s interactive map. The state used GIS to integrate bureau-specific data seamlessly into central and web-facing databases. Since adding mobile functionality, the department doubled activity on its main site. The Pennsylvania Department of Conservation and Natural Resources used GIS to build an interactive map revealing all state parks and the features that each has to offer. The map has seen a steady climb in users as officials regularly update it with added features and information. 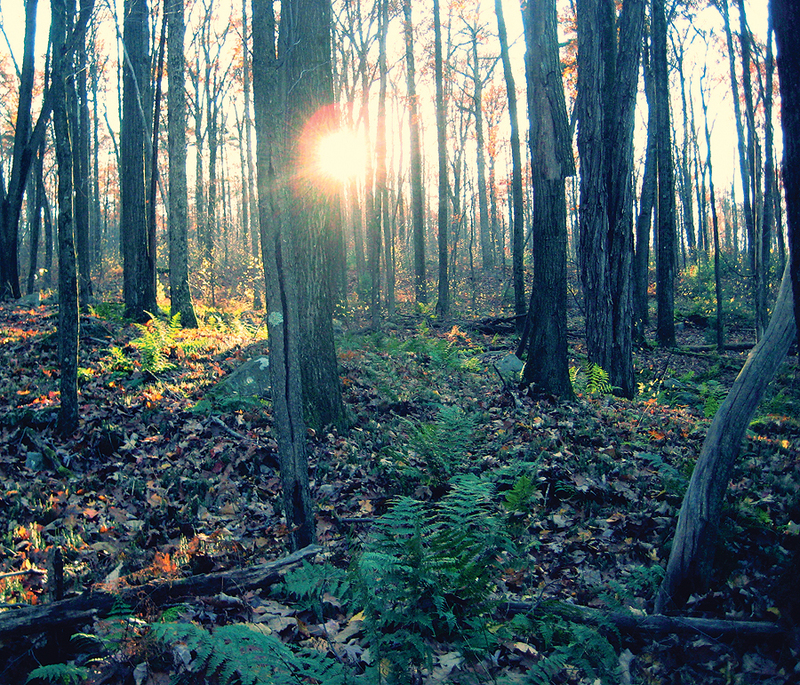 More than half of Pennsylvania is swathed in temperate forest. Out of those 17 million verdant acres, the state Department of Conservation and Natural Resources (DCNR) manages 2.2 million as state forest, along with 120 state parks. It serves as the primary agency to ensure sustainable use and maintain viability of the important economic and environmental assets. That combined role of steward and recreational leader has driven the department to embrace GIS technology. Among other GIS successes, DCNR developed its interactive map. Through the map, users can quickly access information on each of the 120 state parks, determine what facilities they offer, view park maps, select hiking trails, get driving directions, link to photos and videos, and even make camping reservations. The ArcGIS API for Flex based interactive map was launch in April 2012 and has generated positive response. In 2013, it has averaged 30,000 hits per month. Because the department has embraced GIS for years and was familiar with the capability of Esri technology, DCNR decided to use the Esri Enterprise Advantage Program as the framework through which it could turn the interactive map from a vision into reality through consulting engagements and premium support. Michael Bialousz, GIS director for DCNR, worked with Esri Professional Services staff to help pull the pieces of the interactive map together. The team created a replication strategy to integrate bureau-specific data seamlessly into central and web-facing databases. Foundational work needed to launch the map was conducted earlier with the release of ArcGIS 10.0, at which time DCNR built a series of statewide mosaic datasets for Pennsylvania (PA) Map imagery and lidar data. In September 2012, state forest information was incorporated into the map. The update added forest boundaries, office locations, wild and natural areas, and designated state forest hiking trails. Search functions and driving directions are incorporated into the update as well. Geologic information was incorporated in November 2012, allowing users to overlay parks and forests with bedrock geology, outstanding geologic features, earthquakes, and more. “This is our approach for the foreseeable future, and really, we see this application as our primary GIS data-sharing application across all our program areas,” Bialousz says. 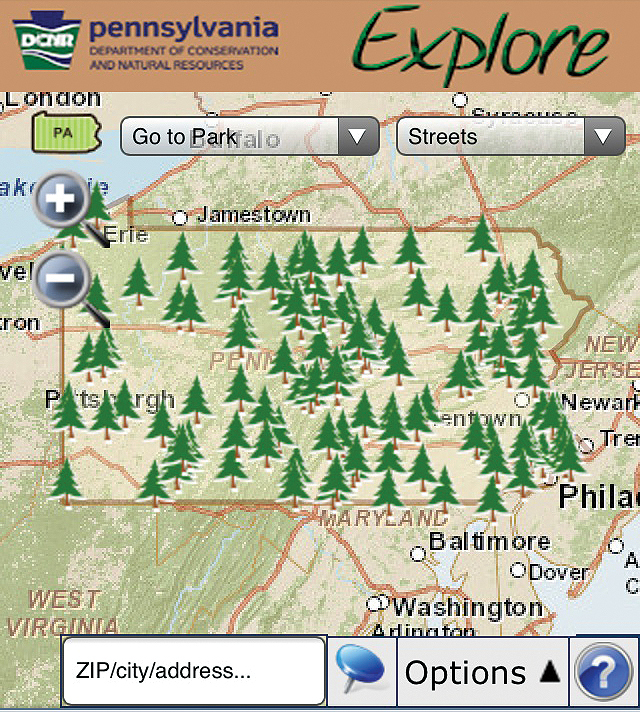 As a natural consequence of all this success, in August 2012, DCNR went a step farther and launched a mobile version of its website with interactive maps. The interactive state parks map proved so successful that the DCNR quickly released an app tailored for mobile users, offering similar functionality plus driving directions. “The mobile website revolutionizes the way we use technology to connect citizens with the outdoors,” says Stephen Aux, DCNR chief information officer. Since the mobile application was introduced, thousands more have reached into the department’s services and offerings. “This is just the beginning; we intend to build upon the site,” Aux adds. Data added to the main page also goes into the mobile version. Since adding mobile functionality, the department doubled activity on its main site, which gives users the option of going to a site optimized for mobile. During 2013, information about Americans with Disabilities Act locations, where disabled citizens can find state park and forest resources and locations meeting their needs, was a critical addition to the interactive map, along with other features. DCNR also became the first Pennsylvania state agency to embrace story maps with eight deployments during the fall of 2013. These function to supplement existing web and interactive map resources and support the many missions of the Pennsylvania DCNR. For more information, contact Michael Bialousz, GIS director, DCNR; visit maps.dcnr.pa.gov/maps/index.html or the mobile site; or contact Taylor Sims, Esri.